But the shiny green wall is eye-catching. Great picture! Lovely balconies and nice coloured facade. Not to mention the beautiful green tile/bricks. The colors, the railings, what a lovely building. Somehow the clothes fit the scene. Nice. 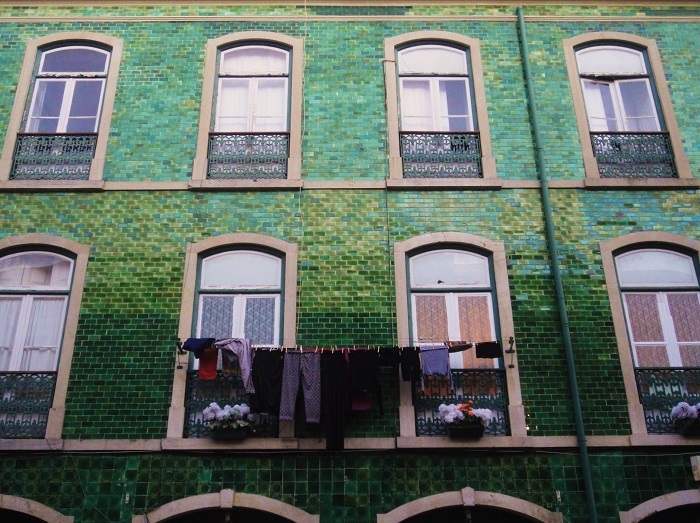 A lovely, colorful building indeed and drying clothes does make the balconies serve an extra purpose!! Great shot for the day as always, Jose!! Hope you have a wonderful new week!! Enjoy! Ooh, I love the green tile. Love the facade of the building, but the fake flowers are a little weird. I like that shade of green. I really like this photo, Jose. It says a lot about the community you took this photo in. The green tiles reminded me of snake or lizard skin, or the feathers of a hummingbird. I love the symmetry of the composition. I love the tiles here … look like they belong in a swimming pool.